Winter arrived in Northern Michigan with a brutal cold and windy storm last week. With single digit temps at night and highs barely approaching 20 during the day, ice fishing was sure to be just around the corner. I decided to forgo my steelhead obsession this weekend and test some of my ice fishing lakes for bluegills. Saturday morning I walked out to a spot I've had success with in the past, drilled a single hole through 7 inches of ice, and setup the shanty. About a minute and a half later I put the first keeper on the ice. Two hours after that I landed #25. This lake produces quality bluegills and even a few really big gills each year. I didn't find any extraordinary fish today, but was definitely pleased with a limit of 8's and 9's. I was fishing off a point in 17FOW. Small teardrop jig tipped with a wax worm. Black was the hot color in the early morning, but they quit responding after I landed about 10 fish. I switched colors and the bite turned back on. With such hot fishing, I headed home, got some things done around the house, and packed the shanty for the following morning. Sunday was even better. My buddy Brian and I both limited by 11am. I got to the lake extra early Sunday and caught about 5 crappie before the gill bite turned on. 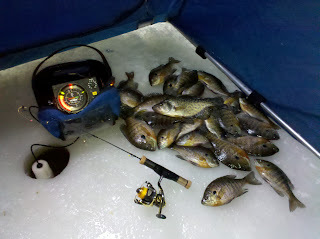 About 8:15 the crappies were gone, and the bluegills came in swarms. It was like someone flipped a light switch. The fish below had a giant forehead and I thought he was especially cool looking. When I hooked into this largemouth bass I immediately knew something was different. He was stripping drag and put up an excellent battle on the ice fishing rod and light line. Easily a keeper, but I tossed him back to try and break anther fisherman's line! Wow! Two days of limits, and a bonus bass, very cool AO. I fished some ice near Sagainaw Bay Saturday and hit the century mark on perch, but only 30 were keepers...I love first ice! 100 Perch! That's awesome! Good work and good luck on the AuSable tomorrow. Great post, nothing wrong with giving the steelies a break!